The year 1991 was a turning point in history. The Soviet Union collapsed, and Middle Eastern problems came to the forefront of American consciousness. Most importantly, the ideas of the racially aware political right had become mature and properly positioned to grow. The documentary Blood in the Face captures a gathering of white advocates in rural Cohoctah Township, Michigan in the last, lazy summer days before the racially aware right-wing movement started to break out into the mainstream. Indeed, the film’s production and release itself is an epiphenomenon of the racially aware right’s 1990s break-out. While the documentary was released in 1991, it was probably filmed earlier. An interviewer mentions Ronald Reagan as the current President — he served between 1980 and 1989. White advocate Glen Miller discusses his Senate run in the present tense — that run occurred in 1986. There is a numerological reference to 1986 also. Some of the white advocates shown in the film will be recognized by readers of Counter-Currents today. Blood in the Face is not produced by people sympathetic to the movement, but it is still (sort of) fair. The film allows white advocates to talk freely. They seem normal. These pioneering white advocates explain their reasons for their beliefs and concerns, and provide some personal histories. Some of the parts of the film are edited in such a way to make the participants at the rally appear contradictory, conspiratorial, or paranoid. The movie unfairly sneaks in archival footage of white advocates not present at the rally. The speakers in the archival footage use the hyperbolic style of ministers in the 1980s and they appear, according to one reviewer “hateful and delusional.” Speeches of activists like William Luther Pierce are edited down to one sentence, while unscripted discussions with participants are allowed to run on with all the “um’s” and “I means” etc. One thing that stood out is that other than a few exceptions the white advocates are from the northern United States. Even with so many Confederate flags in the movie, most of the film’s subjects speak with the accent of the Union Army. The biggest ethnic conflict in the United States is that between Yankees and Jews. 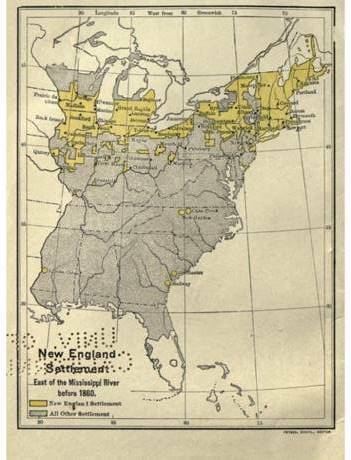 This picture shows the expansion, up to 1860, of Anglo-Americans who trace their origin to the original settlements of Puritans in New England. Blood in the Face is filmed in Cohoctah Township, Michigan – well within this cultural zone. Another location referenced is Norman, Illinois – also within the Yankee cultural zone. Blood in the Face should be looked at by today’s white advocates as a moment in time preserved in a way that one can look back upon to see what would end up working, sort of working, and what didn’t work at all in the coming decades. In the future, cross burnings and Klan robes will be seen as a genuine cultural ritual for a particular people. However, until that day arrives the robes of the modern Klan and cross burnings are best done in the private, invitation-only sphere. Otherwise these items need to be in the irrelevant column. Irrelevant for converting those people that are undecided. Klan rituals are too off the beaten path, too off-putting, and so demonized that a family man and solid citizen cannot attend without taking a big risk. Other fun but irrelevant items include dressing like Nazi stormtroopers. By the end of the seventeenth century, England’s many Protestant, biblicist sects recognized that no single one of them could reasonably expect to occupy the ground of the old Catholic Church. Each could still believe that it was in possession of the full and only gospel truth, each little chapel could glory in the knowledge that beneath its humble eaves were gathered the earthly representatives of the One True Church of God—but this was a primacy that the secular world would never acknowledge. However, Christian Identity is still partially effective. It can help frame the debate. It can organize support for a political campaign and it can get like-minded people together for other reasons. However this movement has drawbacks. Some white advocates might interpret the Old Testament as a story of Jews swindling themselves and others while carrying out acts of genocide in the name of their Semitic deity at face value. Additionally, the numerology within Christian Identity and (other spiritual movements) tends to be a distraction. Part of the limitation is the fact that competition between Protestants can get pretty fierce. Things can go bad quickly between two similar denominations of this Christian Branch over petty matters. Additionally, one sect can raid members from anther. Other white advocates don’t believe at all, or have gone to paganism or non-traditional faiths. To the unconverted, the lingo of Christian Identity might work on someone “into the Bible,” but might just as easily drive someone away. 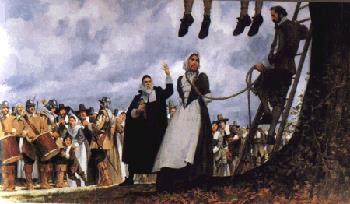 Protestants can be really mean to each other over rather minor theological points – Puritans hang the Quaker Mary Dyer and her colleagues in Boston. This occurred in 1660, when Massachusetts Bay Colony was sitting on a white-red racial powderkeg. Despite the criticism above of the Christian Identity movement in general, the Christian Identity preachers themselves come across looking good. They are serious men who speak well and dress well. While the Christian Identity ministers’ interpretation of things might be long on the Bible and run the risk of arguments over trifles, it is clear they have a good grasp on current events. Their concern about Communist inroads into Mexico and Latin America seems conspiratorial today, but during the late Cold War this was not idle theory. The Soviet Union really did sell arms to Latin America. In the 1980s, the Soviets also sponsored Communist governments and movements in Nicaragua, Guatemala, and El Salvador. Communists even took over Chile for a time in the 1970s. Even as the Cold War came to an end during the film’s 1991 release date, the Soviet Air Force was still sending nuclear-capable Bear Bombers to fly from Murmansk, down the US East Coast, to Cuba. It’s not just the Communist world in Latin America that’s been a problem. The United States and Mexico have a stand-alone bad relationship. The two nations have had border skirmishes since the 1840s, and European troops were stationed in Mexico in the 1860s. Had the Union Army not won the Civil War, there could have been a French-sponsored Reconquista in the 1870s led by Maximilian I of Mexico. Since the start of the 20th century there is a low grade criminal insurgency on the US-Mexico border. When describing concern over foreign threats, one still needs to be careful in how that is expressed. The film shows archival footage of Christian Identity preachers talking about Vietnamese divisions being infiltrated into the United States along with other wild claims. Immigration has brought “divisions” of gooks, and that is bad enough, however hyperbole doesn’t hold up well through the lens of a semi-hostile film crew. When set to music, the claims appear quite ludicrous. Two other people are mentioned, David Duke and Canadian politician John Ross Taylor (1913-1996). Taylor was “redpilled” as to the JQ and other matters. He organized political parties in Ontario, ran for office, but ran into trouble with the Canadian “Human Rights” Commission and others and was imprisoned. Duke successfully became a Louisiana State Representative, ran for governor in 1990, and then was convicted of “tax fraud” in 2002. Duke’s conviction should be seen as unjust, since the FBI’s specialty is bringing down rightist politicians while ignoring leftist misdeeds, but the results of his conviction were quite real. Duke’s political career was over and his voice suppressed during the Jewish-led build up to the Iraq War. Both cases represent the end goal of this movement — elected politicians who use the legitimacy of the state to make change, but politics rests on culture. North American culture still sees white advocacy as an evil to battle against. Indeed, the entire political establishment is organized with “Nazis” filling the role as enemy. Genuine political activity within the system is thus effective — but limited, and will continue to be so, until the day it becomes effective when the culture changes. The biggest what didn’t work revolves around Glenn Miller. Not the band leader, but the white advocate from the South. He dressed in a paramilitary uniform in the film and gives a funny, “down home” speech in a North Carolina drawl. During his checkered career he ran for office several times and organized some marches. Unfortunately, he got tripped up with law enforcement and didn’t come away looking good. In 2014 he went on a shooting spree at a Jewish Community Center where he killed three whites. Today he is on death row, despised by all. Paramilitary activities are a bad strategy for white advocates. The illegality of them is only part of the trouble. It ends up being a big waste of resources since most Western governments are too functional for a paramilitary be anything other than a big target for infiltration and destruction. Additionally, military style uniforms are an optics risk. Paramilitary members make bold fashion choices. The Order is mentioned in this film. 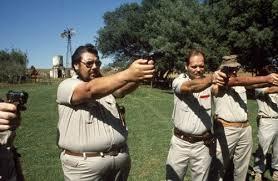 The Order was a violent group of white advocates that were defeated by the FBI. One sees the wife of Order member Bruce Carroll Pierce, who was likely the “trigger man” in the murder of Jewish shock-jock Alan Berg. She is clearly emotionally damaged by the imprisonment of her husband. In the big picture, The Order did produce a romantic narrative not unlike that of William Wallace or Patrick Pearse, but in the small picture the members ended up dead or in jail. It is possible that the 14 Words of David Lane could have spread without the shootouts and long prison sentences. Additionally, a Jewish martyr is a martyr forever, but a living Jew always runs the risk having his crimes and perversions exposed. Had The Order victim Alan Berg not been made a martyr by being killed, he’d be getting #MeToo’ed today. Within the movie one sees the germination of what would eventually become extremely effective: finding a way to make genuine metapolitical cultural changes. William Luther Pierce has one line in the film, and that line refers to the idea of getting racial consciousness out through cultural works such as comic books for children. Don Black, now known as the founder of stormfront.org but at the time still an obscure activist, gives the best speech. He accurately assesses that getting the message out is critical but one must be able to get around the mainstream media. His idea is direct-mail VHS tapes. One can see that Black has seen to the foundation of the issue. When the internet became a factor, he was positioned to exploit it. Don Black is not the only person in the film who wants to change the culture — but he looks the best in his suit and tie and speaks on the matter very eloquently. The first is that many of the participants at the rally discuss race realism. If one realizes the IQ differences between the races, no matter what one believes, one won’t get disappointed, surprised, or bamboozled. All people who genuinely believe in African integration misread data, and that’s bad for everyone. For all of its glitter, the Reagan Economy left the working class in the Middle West high and dry. For example, the working class “Nazis” in Blood in the Face, have one member unemployed although he is able bodied and appears personally well adjusted, polite, and intelligent. The cracks in the Reagan coalition are small but showing in this documentary. George H. W. Bush won Michigan in 1988, and lost it in 1992. Throughout the documentary, problems with Mestizo immigration are repeatedly mentioned. Reagan and Bush ignored this issue and Bush II very much ignored it, but politicians do so at their peril. President George H. W. Bush lost the election in 1992 in no small part to third party candidate Ross Perot who brought up problems with Mexico. The film shows David Duke’s successful election campaign – that occurred in December of 1988, but it was probably added in post-production editing between the filming of the event and the release in 1991. Published: February 26, 2018 | This entry was posted in North American New Right and tagged 1980s, Alan Berg, articles, Christian Identity, David Duke, David Lane, Don Black, Frazier Glenn Miller, John Ross Taylor, Morris V. de Camp, North American New Right, originals, Pastor Bob Miles, Robert Jay Mathews, The Order, white activism, William Pierce. Both comments and trackbacks are currently closed. I’m watching the doc now. Oh man, the part where the Christian Identity guy goes on about the Viet Cong and Mongolian armies massing along the border in British Columbia and Baja California and they play the epic music— C R I N G E.
“They seem normal.” In which parallel universe? When I saw it first back in the 1990s, it rather gave me the embarrassing impression WN is made up of kooks, sectarians and moronic costume Nazis. Re-watching it years later, I hardly feel different about it. One must remember that those at the rally were not being filmed by sympathetic parties. All the edits are hostile. This movement stands on the shoulders of giants, flawed as they may be. Blood in the Face is one of the few works about such men and women. Something is to be said for these people – let’s call them White Nationalism 1.0 – keeping alive certain ideas until they could be resurrected with today’s Alt Right. That their tactics left something to be desired might be excused because at the time the mainstream conservative movement had shifted into the realm of respectability, thus failing to provide the leadership, financing and media savvy for the troops abandoned on a hostile battlefield. Throughout the Reagan-Bush I era, and perhaps into the 1990s, many conservative activists I knew believed that the racial issue was not being addressed. It was not quite stated in such open terms, but individuals were sounding the alarm on illegal immigration from the third world into the USA; others were asking when the Republicans were going to dismantle affirmative action and the various ethnic “studies” rackets on campus which had become centers for anti-White agitation. They expected one day a Reagan or Bush or Gingrich would give the “Word” that now it was time to move on these issues. Of course, the politicians never did. This was so even when the Republicans controlled the White House and/or Congress, and at a time when “liberal” had become a term of disparagement. Obviously, the demographic situation in those days vastly favored Whites. It was easy enough to think that the vital issues of the day were lowering taxes and deregulating business. But underneath it, a lot of people knew something was wrong. While America appeared to be standing tall (we had just brought down the Berlin Wall and would go on to more victories in Panama and later in Gulf War I), the growth of cultural marxism on campus went unchallenged, and non-Whites were making ever more absurd demands. The 1992 Rodney King Riot was an inkling of the simmering insurgency, a dress rehearsal for the later Black Lives Matter offensives. And the defection of much of the GOP Congress into supporting sanctions against White governed South Africa showed the worthlessness of mainstream Republicans when it came to race. Some time in the 1990s I had a conversation with a proto-race realist activist over the issue of why Black (and Chicano and whatever else) Student Unions were subsidized by campuses and corporations, but White Student Unions were not to be seen. He (cynically) re-stated the party line about how minorities still had to catch up, thus discrimination against Whites was legit. His point was that White people were in fact being marginalized, and politics-as-usual were not going to stop this process. He went off to organize various radical (and non-violent) cultural actions to reawaken White racial consciousness. There were perhaps hundreds or thousands more people like this fellow who saw what was going on way back then. And I’d like to think they provided the inspiration for the rise of White Nationalism 2.0. Christian Identity is bunk. I’m a Christian with fascistic sympathies, but theological racism in the New Testament isn’t biblical. Anyone who has ever seriously studied the Bible can demolish Christian Identity arguments very quickly. I’m against multiculturalism simply because it’s bad for people overall. Before anyone criticizes Christianity, the occult nonsense spouted by larpers in mumbo-jumbo groups such as “Order of the Nine Angles” and “Joy of Satan” do infinitely more damage to the general movement than Christians who are prepared to have an open mind about other races without embracing multiculturalism. 28 There is neither Jew nor Greek, slave nor free, male nor female, for you are all one in Christ Jesus. 28 …God has shown me that I should not call anyone impure or unclean. 14 For Christ’s love compels us, because we are convinced that one died for all. “I’m a Christian with fascistic sympathies, but theological racism in the New Testament isn’t biblical” . . . I’m against multiculturalism simply because it’s bad for people overall” – Well said, and absolutely spot on! Blacks do not possess the ‘mark of Cain’ and all the other nonsense that is spread about them by some ‘Christian Identity’ folks. Such arguments read into the biblical texts idea that are completely foreign from the ancient writers and their intended meaning(s). There is indeed a universalism in the Bible (mostly in the New Testament – cf. Revelation 5:9) in the sense that God accepts people from all racial groups who receive by faith His Son. However, there is no multiculturalism in the Bible in the sense that God wants all national, cultural and racial boundaries folded into an enormous ‘melting pot.’ The Bible clearly presumes that every racial and ethnic group will maintain its unique identity, and there is nothing even remotely suggestive of the multicultural dogma we’ve been force-fed for the past 60 years by liberals. In the age to come, there will be no racial and cultural divisions (meaning in heaven or the eternal state). But we have not yet arrived at that point. Thus, racial divisions and differing identities and cultures will remain until Christ Himself removes such realities at His glorious appearing. Incidentally, none of this means that a White Christian can’t view a Black Christian as his brother in Christ. We surely can. However, this doesn’t mean his people and my people can or should live together in the same communities nor that our unique identities ought to be jettisoned for some ‘equality’ myth.